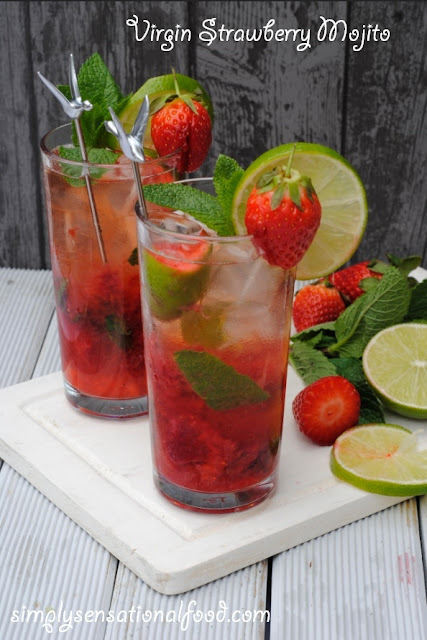 Luscious strawberries, aromatic mint muddled to create this refreshing strawberry mojito. 1. Cut the lime in half and cut two slices for garnish, cut the remaining lime in to quarters. 2. 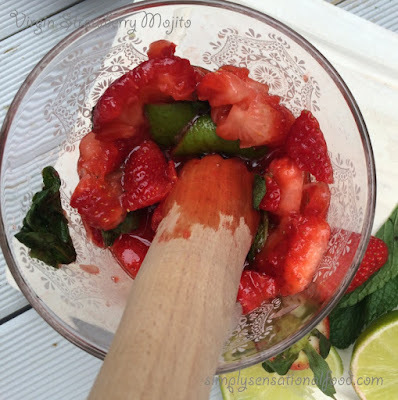 In a jug add the lime quarters, diced strawberries, mint leaves and muddle to release the flavours. Divide this mixture equally into two tall glasses. 3. Add two tablespoons of strawberry syrup into each glass and fill the glass with ice cubes.4. 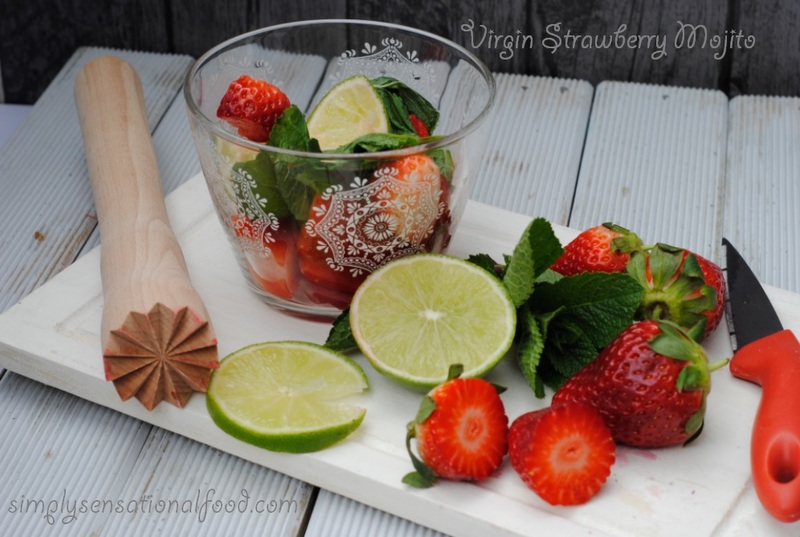 Pour sparkling water into the glasses and garnish with the reserved lime slices, mint leaves and strawberries.5. Serve immediately. 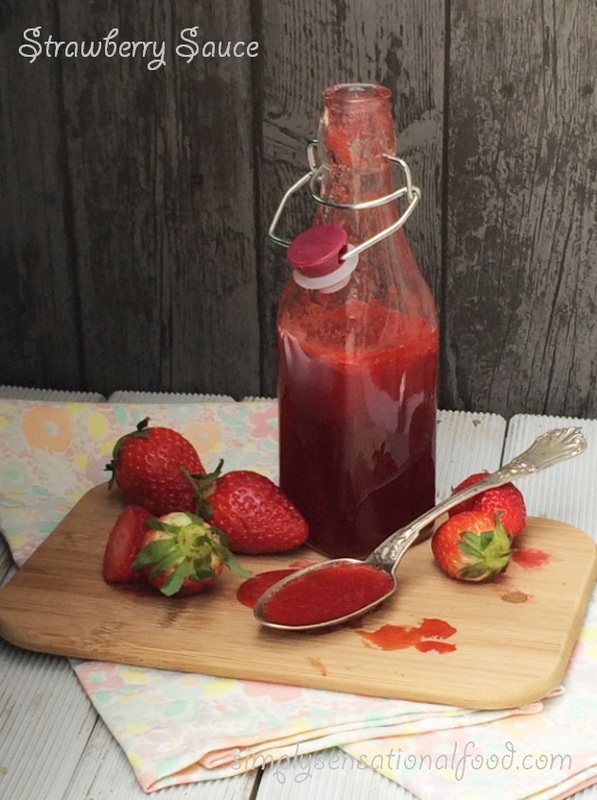 NB-You can find the recipe for the strawberry sauce/syrup here, alternatively you can use shop bought. Since the strawberries are now coming into season you may like some more ideas in which you can make sure of them. My favorite berry is the strawberry, I love the tartness and the texture of it as it hits my lips. 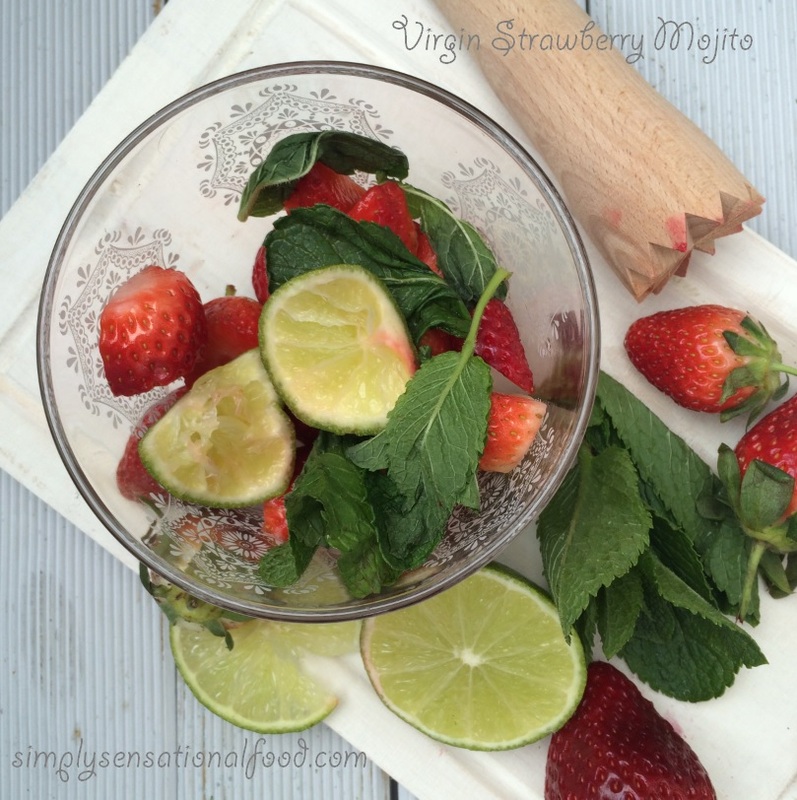 As soon as I see strawberries hit the shops I go mad and buy punnet loads, then of course I have strawberry fever in my kitchen and the dilemma as to what to create with them all. This simple strawberry sauce is one of my favorite recipes that I make when ever I can get my hands on ripe strawberries. Its perfect drizzled on pancakes, icecreams in drinks and also poured on porridge. A fruity and delicious Strawberry Sauce. 240g Strawberries hulled and cut into quarters. 1. Place the strawberries, lemon juice,sugar and water in a pan and bring the mixture to boil.2.Once the mixture starts to boil, reduce the temperature and simmer on a medium heat for 15 minutes until strawberries start to break and look mushy.3. Turn off the heat and sieve the mixture through a stainless steel sieve. 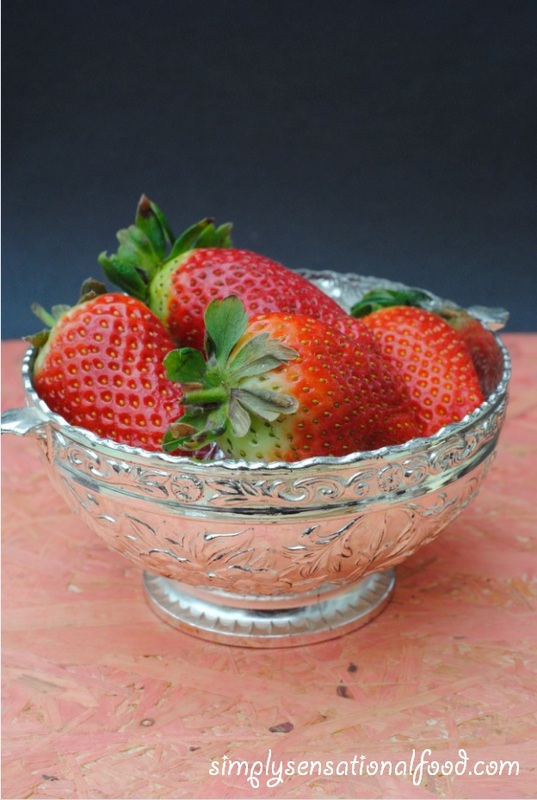 If you want clear strawberry syrup than do not push the cooked strawberries through the sieve, just strain and keep the liquid.If you require thick strawberry sauce than push the strawberry through the sieve to get a thicker mixture. (In this recipe I pushed the strawberries through the sieve which is why mixture is thick and not clear.)4. Allow the sauce to cool and then transfer it to a bottle. 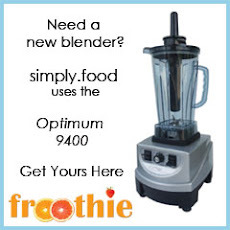 You can use this in drinks or to drizzle over ice cream. Store the sauce in the fridge. 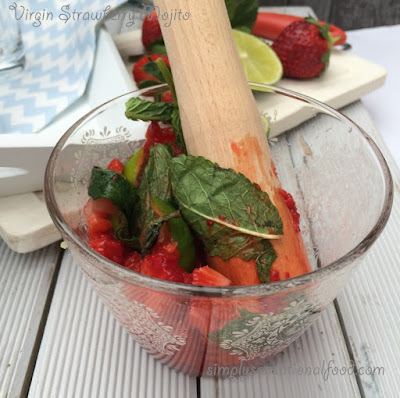 If like me you too love strawberries then here are some more delicious recipes to create with them. 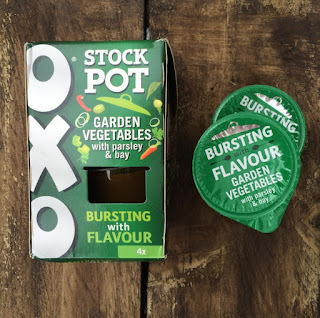 In this delicious rice dish I have used the OXO vegetarian stock pot, which turned the plain boiled rice into a flavoursome and delectable dish that can be made in a jiffy. The stock posts are concentrated so don't be tempted to add extra spices and salt. 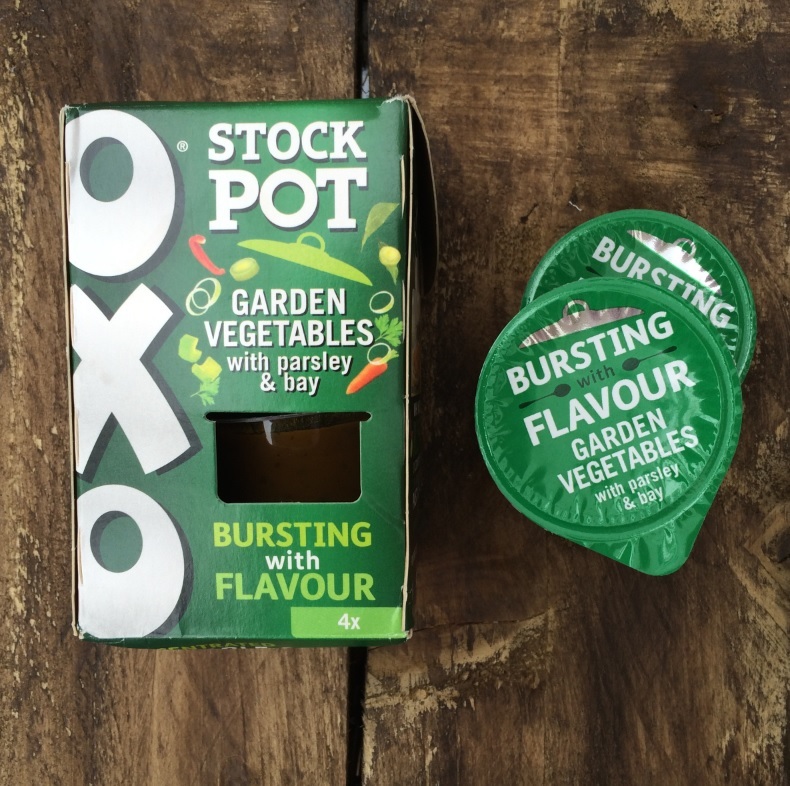 The Oxo stock pots are packed with intense flavour and are perfect to add to your soups, stirfries, curries, rice dishes or pasta. 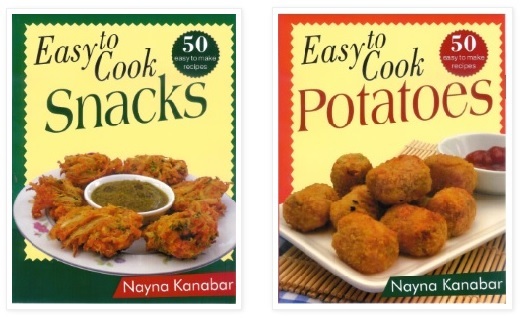 They are versatile in use and available 3 different flavour combinations; Garden vegetable with parsley and bay, rich beef with onion and rosemary, succulent chicken with garlic and thyme. 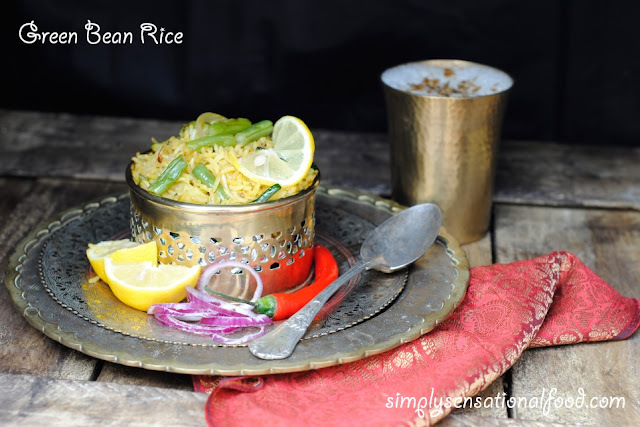 Fragrant lemony rice with green beans and courgettes. 1.Top and tail the green beans and cut them into 1 cm pieces.2.Top and tail the courgettes and cut it into 2cm julienne pieces.3.Add the oil into the wok and once it's hot add the onion, courgettes and green beans and stir fry them for about 3-4 minutes or until the vegetables start to take slight colour.4. 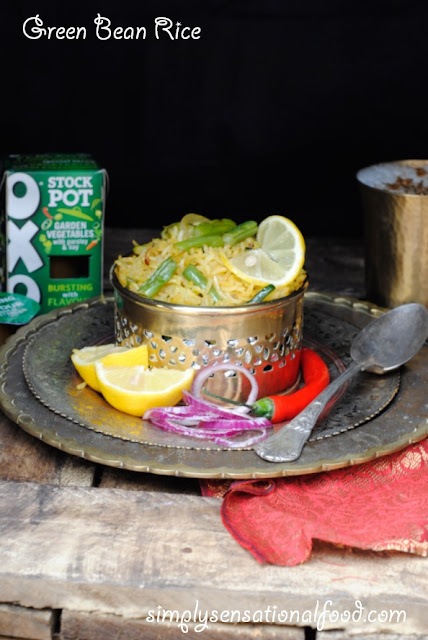 Add the contents of 1 OXO stock pot to the vegetables and the lemon juice and turmeric and toss all the ingredients together until all the vegetables are coated.5. Add the rice and green chilli and stir fry the rice for 3-4 minutes until its full warmed through and is totally mixed with the vegetables and flavouring.6. 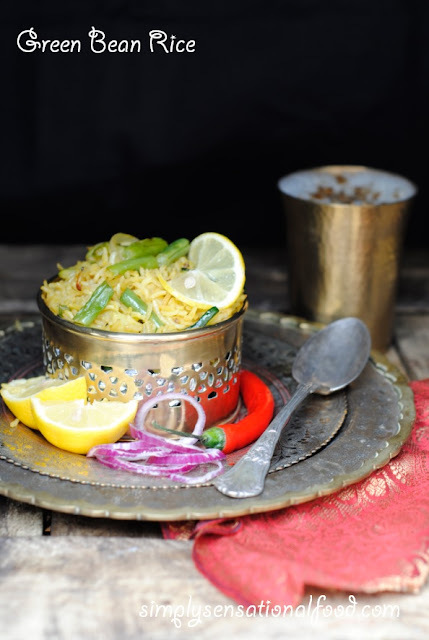 Transfer the rice to serving bowls and enjoy with a curry or cucumber raita. 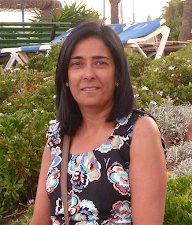 I love trying new products and as always I would like my readers to have a chance to try the products too. Oxo have been really generous and have put together a goody bag of some lovely things that I have to give way to one simplyfood reader. 1x Ladle, 1x Mackie’s Soup Mug, 1x Sistema Microwavable Travel Mug, 1x OXO Cookbook and a selection of x5 OXO Stock Pots. This month I have had an interesting collection of products in my pantry to sample. They did not arrive through the post, instead I had the opportunity to attend the Bloggers tea party where a few of these brands were showcasing their products. 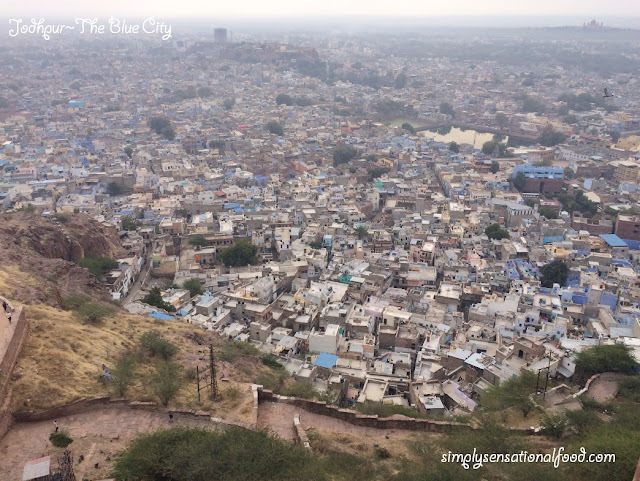 I had the chance to meet the creators behind the brands and taste their awesome products. Fruit Jerky- A delicious vegan gluten free fruit snack made from misshapen rescued fruit. Two delicious flavours Apple and Raspberry and Apple and Mango.These are the perfect on the go snacks. 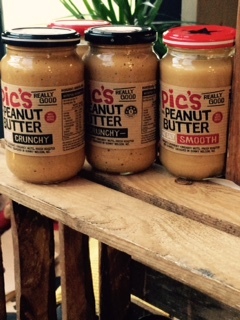 Pic's Peanut Butter - Pure peanut butter made from roasted peanuts and ground to make peanut butter. There is the smooth or crunchy variety. No other additives are found in this jar of goodness from New Zealand.The crunchy peanut butter was divine. Chika's A taste of the Exotic- A collection of tasty snacks from West Africa which include Chickpea crisps, cashew nuts , peanuts, smoked almonds and plantain crisps.There were truly delectable and moreish,I could continue to nibble on these fore ever. Jakes Boost- All natural nut and seed butter which is sugar-free, palm oil-free, salt-free, gluten- and dairy free and vegan.I loved the addition of the seeds and the crunchy texture they gave the butter. Biotifuldairy's Kefir Organic Cultured milk smoothies - Smoothies with probiotic cultures and vitamins and minerals in 4 different flavours Honey and Mint, Morello Cherry, Riazhenka(baked milk) and Kefir. I had never tried Kefir before so was pleasantly surprised at the taste. 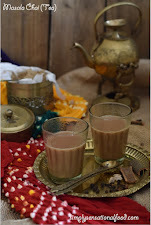 Drink me chai- Drink Me Chai Latte is range of delicious award winning Chai Latte’s inspired by the original Chai from India.Being a chai drinker these collection of chai's really rocked my boat. Just Bee Honey water- Natural spring water enriched with a drop of honey in three delicious flavours Blueberry, Lemon and Green tea and Apple and ginger.I was really so impressed with this drink and really enjoyed the Apple and ginger one although all three flavours were great. I would like to Thank all the brands that gave me their product samples to taste. All views and opinions are my own.